It was the month of october when Phialin cyclone was going to arrive at Andhra pradesh and Odisha , every thing and every one was in a state of shock whats going to Happen ? But thanks to the Government authorities whose hard work and pre evacuation programme saved many a lives. I dedicate this blog of mine to all those who suffered and to the Government Authorities. 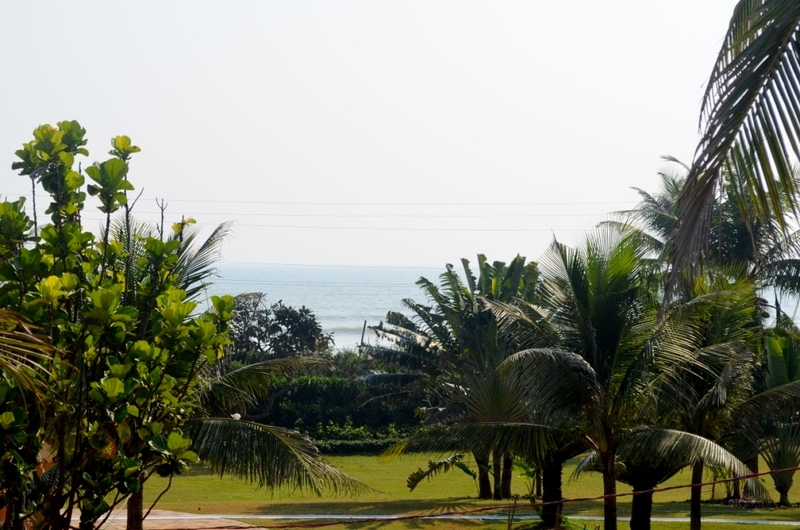 I was suppose to visit Puri in Odisha for a 3 day holiday with my wife in November , Thanks to The Hans Coco Palms. Things were bit different now , situations had changed and so was mood of my family thanks to Phialin. 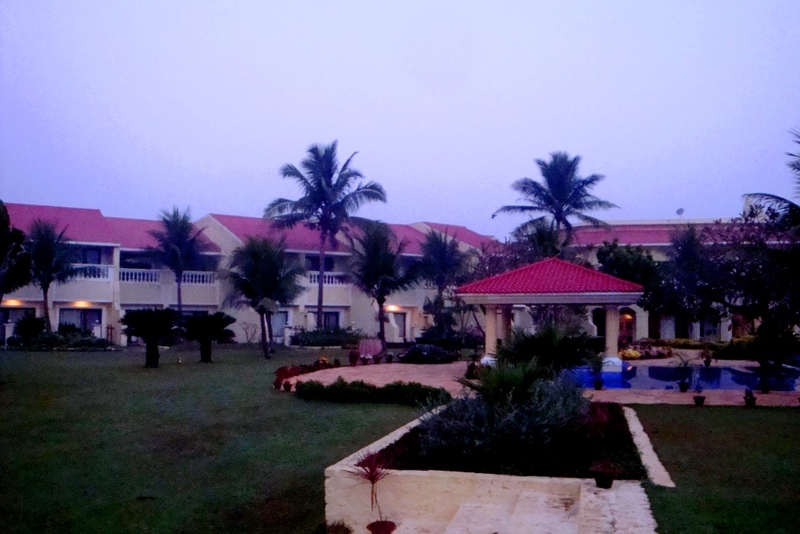 I had to enquire to The Hans Coco Palm staff about the situations there , and they told me it was all perfect now , Phialin was going to struck Gopalpur district and Puri is somewhere around 250 Km away from there , though it had given some heavy showers there but rest of all was perfectly fine. We were going to travel some 2 hrs more on road to reach Puri from Bhubhaneshwar , day was becoming very tiring , thanks to the two and half hour flight. Trust me , flying now a days has seriously started to take away all my mood , i still remember when i sat in a flight for first time when i was a kid it was such a joy. Sometimes i even think ” Whether i have become too tall or they have shrunk the plane way too much , but suddenly one thing comes in my mind that my dad used to sit very comfortably with a very nice leg room and i am not that much taller than him , it gives me my answer that they have shrunk a lot “. Whatever i used to think , that was a secondary thing now primary thing for me was now to have a hot water shower , i knew only that could ease me a bit but for that first to reach was The Hans Coco Palms. Atlast after two and a half hour drive we were at The Hans Coco Palms , time to check in. 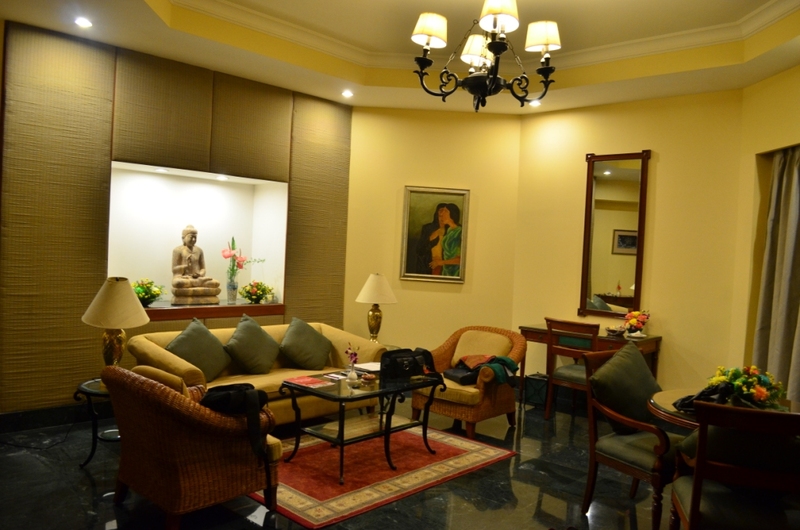 They had given me the Suit room , and just a glimpse of it had taken half of tiredness away from me. But i would accept, my wife was more happy and seeing her like this , suddenly she was looking like my 4 yr old niece as she almost imitated her in her movements. After a hot water shower, we thought of going outside but after a suggestion from Hotel staff we prefered to roam around the hotel swimming pool only , we wanted to relax a bit before having dinner. After relaxing a bit and taking some pics of swimming pool , now was the time to sit and eat. We wanted to have dinner outside at the pool side , as i could feel not a single mosquito was troubling me and i was loving the cool breeze coming from the sea , sea was roaring like a lion , amazing music to hear. I just walked in to the restaurant and asked them if i could have dinner at pool side ? 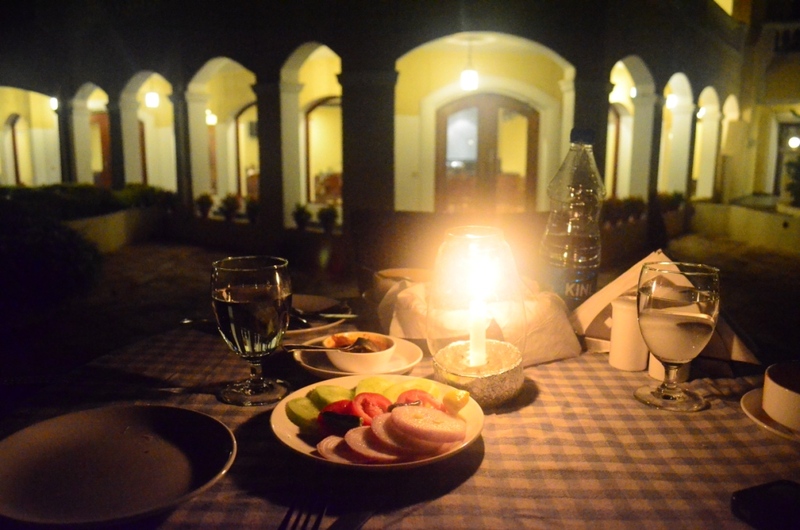 Thanks to Mr. Niranjan to whom i talked that time for Dinner outside , he said Yes , and trust me i think it took less than a minute for them to arrange a candle lit table for us on the pool side. Dinner was ordered , just simple food , appetite had gone down due to tiredness. All the time one waiter was standing right next to us , the time when food had not come while we were eating and even after we were finished , i had to tell him i am over and now i wont be needing anything so you can rest boss, then he left wishing us goodnight. We sat there for some more time , i was loving the roar of sea , may be i couldnt see the tiger at Sariska National park recently thats why i wanted to suffice myself with roar of sea only. Next day , early morning at 7.00 am i got up , please dont laugh, for a tired man sometimes its early morning. I could feel the mist in air , it was bit foggy outside, sea had lowered its high pitch. I went for a little walk to the swimming pool , it was bit dark when we had reached to the The Hans Coco Palms , so till now i had not seen the whole resort even. 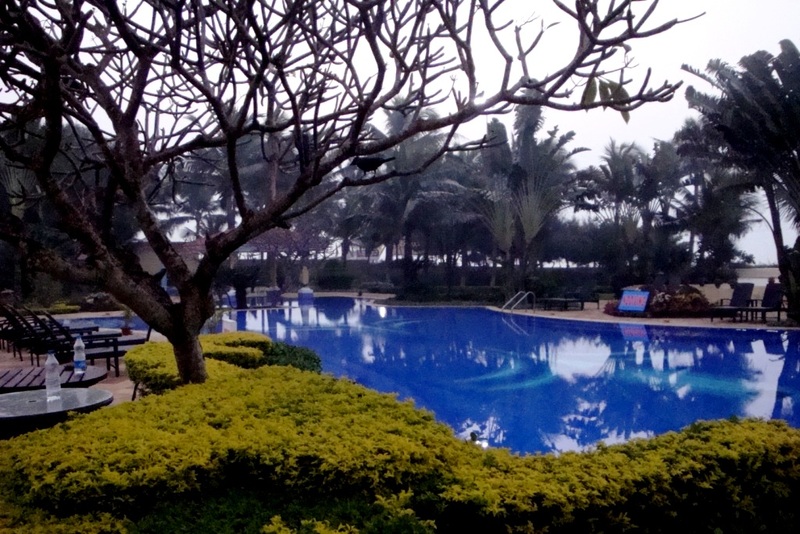 I had never guessed ever in my life , that morning would be so pleasant walking at that pool side feeling the mist in air. Then came the right time , when i could see The Hans Coco Palms resorts full wide angle view, it was awesome. Sorry for Blurred image , my greedy camera was tired and his soul was in the charging mode. After some hours , when sun was out and we were ready to move out towards Jagannath Temple , i came out to the balcony of my room , this awesome view was in front of my eyes. Sea was just in front of me , i could feel the waves coming towards me like they are calling me. This is the best part of The Hans Coco Palms , all the rooms on first floor has sea view and all the ground floor one;s have swimming pool view. Water water everywhere and the eye soothing greenery , The Hans Coco Palms has been receiving the best green resort award in Odisha from some years and the proof was in front of me. How could i deny the call of beach , we went for a bath as its considered sacred to go for Jagannath Temple after taking the bath at Puri beach. 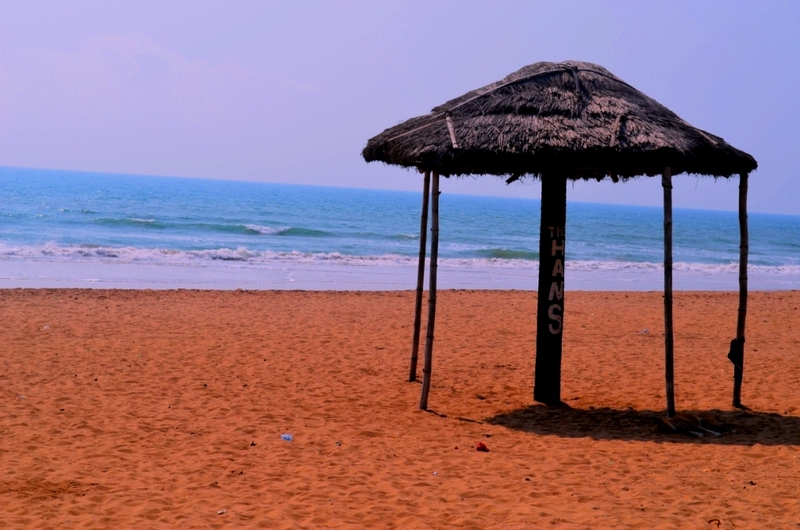 I would say , it was the cleanest beach i have ever seen , compare it with any other beach of India , so far i found it to be the cleanest off , and i am not talking of the private beach area of The Hans Coco Palm only , the whole stretch is very neat and clean. We went on towards Jagannath Temple , sorry i had not taken any pics of that as camera is not allowed there and didnt wanted to cheat Lord Krishna. Yes yes yes there she is , Here comes the Dolphin …..